Have you heard of the term Paraplanning? Any idea what it could mean? A new concept of the financial industry, Paraplanning focuses on the administrative tasks required for businesses. These administrative duties are usually handled by the financial planners. They also manage product research, asset allocation, fund selection, report writing etc. As financial planning is a major part for businesses, it is important for you to choose a paraplanner who can manage all of your business finances. Paraplanning can be either in-housed or outsourced. 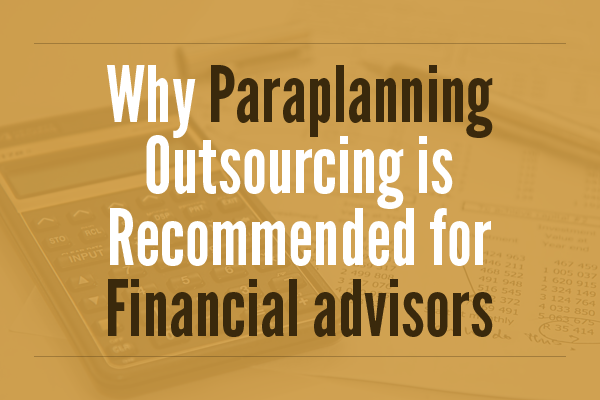 Why Paraplanning outsourcing is recommended for financial advisers? What are the benefits? Outsourcing your paraplanning is a good alternative and here is a short insight about the advantages of Paraplanning outsourcing. If you are in search of outsourcing Paraplanning Company then contact us. We have professional paraplanners who can meet all your business requirements. CNGBS provide the highest quality business process outsourcing solutions at competitive rates with dedication to building strong partnerships and a solid commitment to our clients.